When Should I check my EXD Battery? The EXD uses a custom battery that lasts about six months. This battery is available only from Angel Medical Systems. Caution: Use of a battery other than the EXD battery supplied by Angel Medical Systems may damage the EXD or cause it to malfunction. 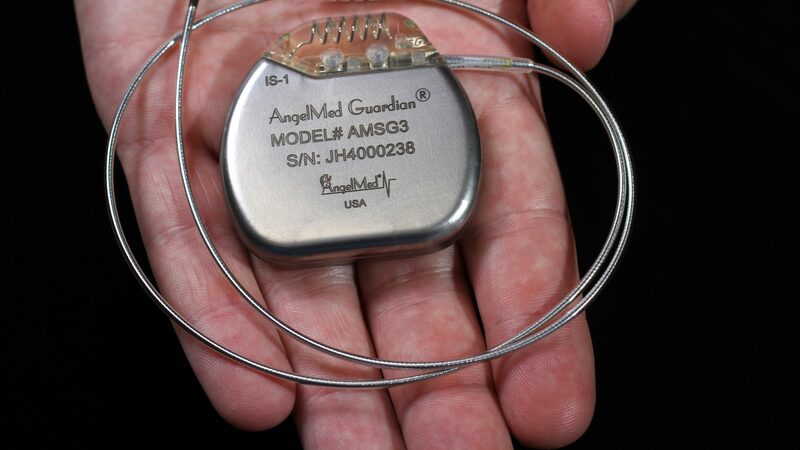 Although “AA” sized batteries will fit in the battery compartment, only the battery supplied by Angel Medical Systems allows proper functioning of the EXD. Push the Silence Alarm/Check Battery button on the EXD. If the battery is working, the EXD will beep one time. If the battery is not working, the EXD will not respond. When the EXD battery power is low, the EXD issues the Low EXD Battery warning. This warning means that the EXD has one to two days of power left before the battery must be changed. During a Low EXD Battery warning, the EXD beeps one time, pauses, beeps again, and so on. Unlike the Emergency alarm or See Doctor alert, the Low EXD Battery warning does not cause the IMD to vibrate. Patients should check their EXD’s battery power once per week. If the battery needs to be replaced, the patient should see his or her physician in the next day or two to replace the battery. You can silence a Low EXD Battery warning at any time. To do so, just push the Silence Alarm/Check Battery button. Note that unlike the Emergency alarm or See Doctor alert, you do not need to hold the EXD near an IMD to silence a Low EXD Battery warning. When you silence the Low EXD Battery warning, the beeping stops for a period of 12 hours at which time the warning starts again. Restarting the warning serves to remind patients that they must see their doctor to change the EXD battery. You can silence the Low EXD Battery warning any number of times. Open the EXD’s battery compartment by pushing down on the right-side of the battery cover and sliding it to the left. Insert the positive (+) end of the new battery into the battery compartment, then push down on the battery’s negative (−) end. Caution: Only use batteries supplied by Angel Medical Systems. Caution: Check the expiration date on the battery shipping box to ensure the battery is fresh. Close the battery compartment by sliding the battery cover completely to the right. To confirm that the battery was correctly inserted and is working, push the Silence Alarm/Check Battery button. The EXD will beep one time if the battery is working. Discard the depleted battery according to local environmental regulations.